The LG G5 is already here, and so is the Galaxy S7! Undoubtedly, the most curios part of the phone is its expansion slot mechanism, which enables users to insert different modules inside the device, expanding its functionalities. This is not the only highlight of the phone, though - it's a flagship on all fronts, with hardware and design to meet its top tier status. There are two main problems before the G5, though - one of them is called the Galaxy S7 and the other one is called the iPhone 6s. These two can hardly match some of G5's features, most notably the expansion Magic Slot, but this doesn't mean that LG's newest blows them out of the water. 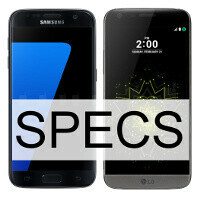 Indeed, here's how the three stack up against one another in our improvised specs comparison. We've rounded them against each other, and it's up to decide which one is best-endowed for the task at hand. The phone is quite nice. Though the 'friends' and 'LG playground' are too cheesy names. Also the presentation seems pretty bad. Also they are calling it unibody, but it isn't, since the bottom comes off. With 5.3 inch display, 2800mah and an always-on display which consumes 20% battery a day. I am not too hopeful for LG G5's battery. They could've designed the modular part better. And the dual sensor looks a bit ugly in my opinion. I liked the g4 design better.. It says the iPhones is 1.2 and the s7 is 1.44....so that means the s7's sensor has larger pixels. iPhone is the only one with a desktop class CPU architecture, only one with 3D touch, only one with SSD-class storage out of all three. It's also only one available fore sale, so there is no discusion. desktop class CPU architecture? well what the definition of that? maybe they just too lazy to design separate architecture for tab and phone... btw, their best SoC (A9x) cant beat i5 version of surface pro 4 3D touch? thats iOS stuff... but maybe S7 or G5 equipped with pressure sensitive screen... SSD-class storage? lol.. the fastest storage for smartphone right now is UFS-2 and samsung is the one who manufacture kind of storage.. The title needs changed. This comparison doesn't include the 6S, but rather the 6S Plus. I dont like glass backs.Its fragile and also attracts lot of fingerprints.Its also slippery to hold.I think samsung must try metal unibody design in their flagships.I think Lg G5 is a great phone to buy and its definitely more innovative than galaxy S7.Meanwhile both G5 and S7 were great phones. Bro, iphone 6 is far slippery than glass back on the s6. But again dBrand skin can eliminate both the fingerprints on s6 and slipperyness in iPhones.